You say toe-may-toes, I say . . . . . Tomatoes should be in a good, plentiful supply in the UK right now. Nice summer tomatoes, sun ripened, sweet and delicious. I am sure there will be many people pickling, bottling, making chutney out of them, etc and when they are so readily available and cheap, why not? These recipes however are for something a little different, something light to serve as an appetiser for a dinner party or as what we call an Amuse Bouche (amusement of the mouth) . . . something to kick the palate into action before the meal. It would also make a great first course for a Sunday brunch, when you are sat outside on one of those lazy summer dayss - a Chilled Tomato Essence or a Consommé with a Tomato Sorbet. Consommé is actually a classical soup, essentially a strengthened, clarified stock. Here we are taking a little poetic license with the word. It is a consommé in the sense that the soup is clear, an unusual crystal clarity in fact, which given the look of the initial mixture, the look of the final essence will be quite surprising. 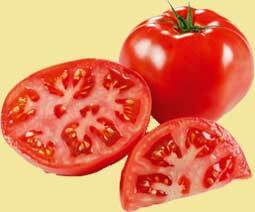 For the first recipe (essence) the tomatoes must be sun ripened, with a strong sweet flavour. For the sorbet I will often use tinned, Italian plum tomatoes. They have a great flavour and remove the need for skinning fresh ones but I have included the method for skinning tomatoes and making what we refer to as tomato concassé if you prefer to make it from fresh. This basic kitchen preparation will come in very handy for many recipes. You can of course stop at stage five once you have peeled the tomatoes and then use them whole for stuffing, slicing for salads, etc - a great technique to use if you are not a fan of tomato skins . . . which interestingly enough the body does not have the capability to break down anyway, they leave us as they went in! These are what we call basic preparations and they will no doubt feature or be referred to in future columns. The French word concassé means to chop or crush.